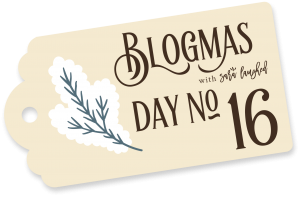 Welcome to the sixteenth day of Blogmas with Sara Laughed, where I’m blogging every day ’til Christmas Day. Head over to my Blogmas calendar to see the full collection, or click on the gift tag below! I didn’t used to wash my face. Like, ever. I grew up with a really clear complexion, even during puberty. My mom had the same skin type, and because she’d never had issues, she didn’t teach me that washing my face in the morning and at night was something I should be doing. But a few years ago, she started asking me for skincare advice. She didn’t like how her skin was changing with age, so she asked me if I knew about skincare routines, since I was into makeup. The truth is, I didn’t know much. I recommended a moisturizer I’d seen in commercials, but I didn’t have much information about other parts of skincare, like cleansers, eye creams, and exfoliants. And that wasn’t an issue, until my eczema started acting up. About four years ago, my eczema got out of control. I’m talking bubbling, weeping eczema all over my fingers, hands, and joints. The kind that constantly itched and burned, and which bled when I scratched in my sleep. It made me feel disgusting, and I worried about people’s reactions when I shook their hands. I was having skin issues beyond the eczema, as well. The skin on the rest of my body was incredibly dry, and my face always felt tight after a shower. These issues were always worst in winter, when my hands would crack and my face would sting in the cold. As college continued, I started meeting with a dermatologist about my eczema, and reading about skincare online. This is the first winter where my skin finally feels under control. Even though I still have eczema and my skin gets dry from time to time, I’m so much more comfortable in my skin — literally — than I have been in years. Below is a before/after of my skin. You may not be able to see a difference, but I can promise that I feel one. I really dislike when people use dramatically different lighting in their before/after photos, because I think they’re intentionally deceptive. I want to be honest, so these two photos are the most similarly-lit and -taken photos I could find. 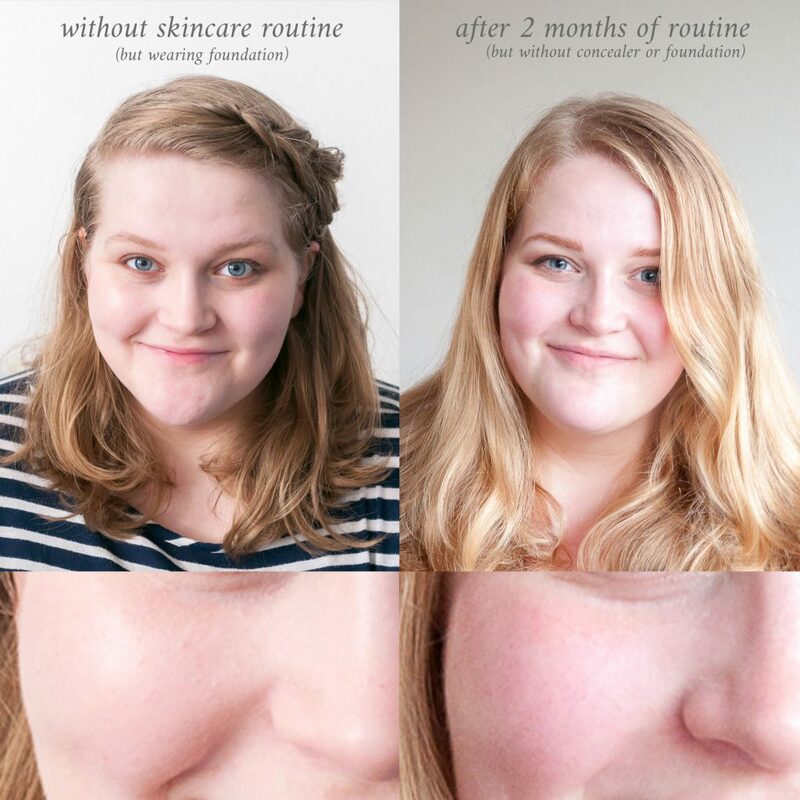 I’m wearing foundation in the first photo (I couldn’t find any bare-skinned photos from before I started my routine), and not in the second — but you can still see that the bumps on my cheeks are significantly reduced. My skin also feels softer and less tight. 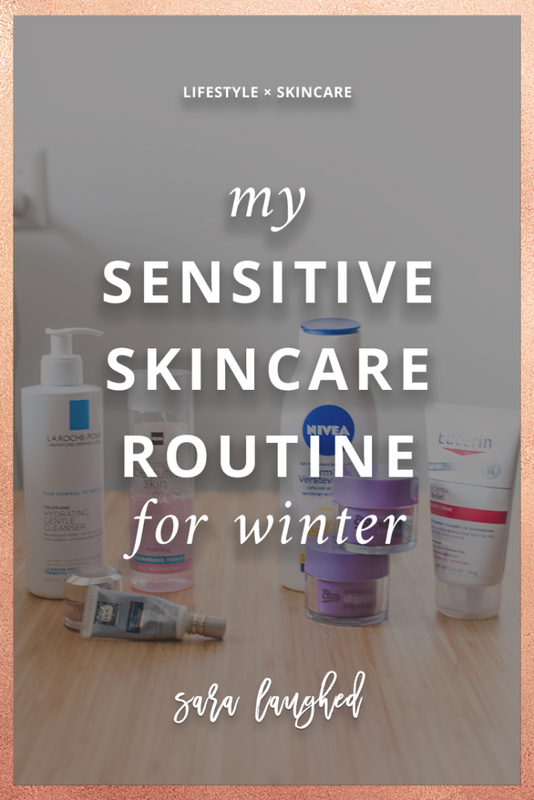 In case you’re also figuring out how to care for your sensitive skin in winter, I’m sharing what I’ve learned this year, and linking to some of my favorite resources. I’m currently not using an exfoliant because my skin is so sensitive, so I use a cleanser, an eye cream, and a moisturizer in my daily routine right now. My cleanser and moisturizer are from Dutch drugstores and cost just a few euros each. To my surprise, they’re both actually really great products, especially for my dry and sensitive skin. This isn’t to say you just try to get ahold of these specifically; just that drugstore products can be just as effective as higher-end products when you’re starting out! The eye cream was a little pricier, but I actually purchased it at Target. 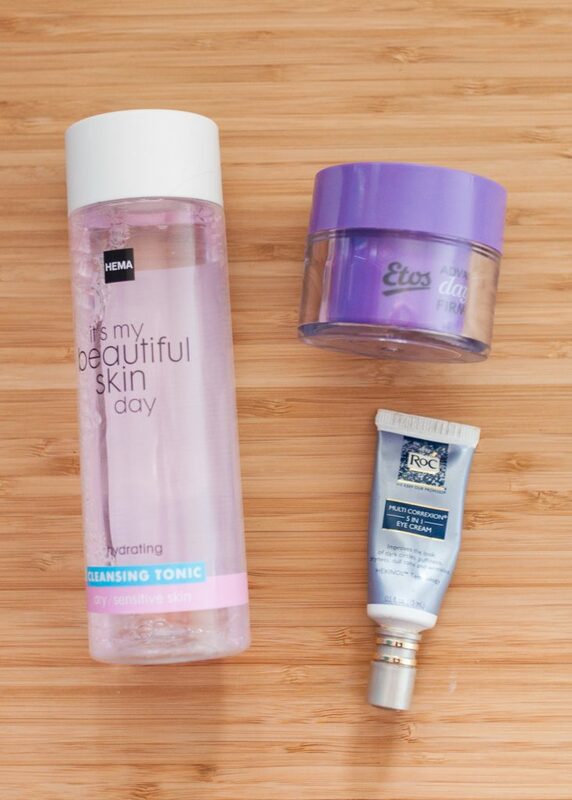 All this to say — your facial skincare routine doesn’t need to be expensive or extensive to work. Two brands that my dermatologist has recommended for my dry sensitive skin are Eucerin and Cerave. I’ve used (and loved) Cerave before, but it’s hard to find here in the Netherlands, so I’m currently using a body moisturizer from Nivea that I love. 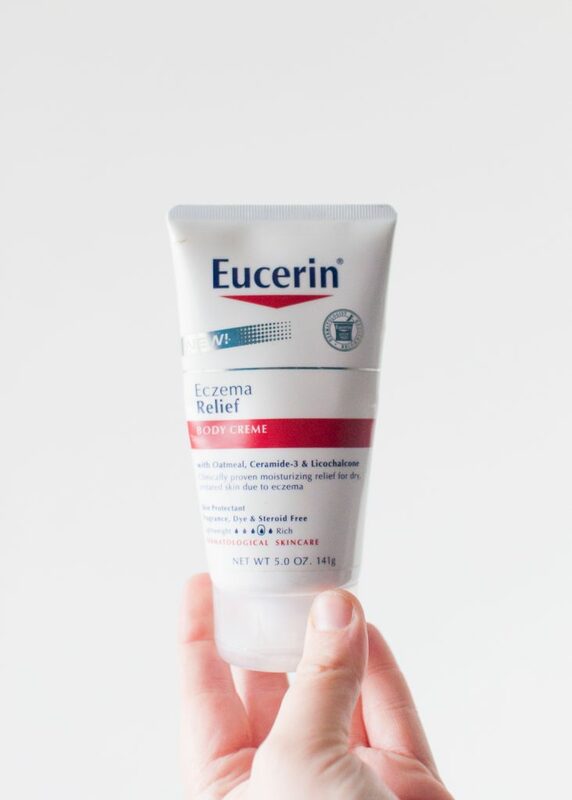 For my hands, my absolute holy grail item is this hand cream by Eucerin. It’s rich without being oily, and keeps the skin on my hands hydrated for hours. I absolutely love it, and I’m starting to run low, so at some point I’ll have to have my mom ship me some more! In addition to having a gentle skincare routine and using moisturizer every day, I’ve picked up a few other tips for caring for skin in winter, especially if your skin tends to be dry or sensitive. First, shower in lukewarm water. I know that, especially in winter, a steamy hot shower is so tempting — and I’ll admit that I still indulge from time to time! But hot water strips your skin of its healthy oils and can dry out already dry skin. Second, moisturize immediately after your shower to lock in as much moisture as possible and prevent your skin from drying out. Third and finally, be sure to drink lots of water. I didn’t know that the water you drink has a big influence on your skin until I was told so by an aesthetician during a facial. 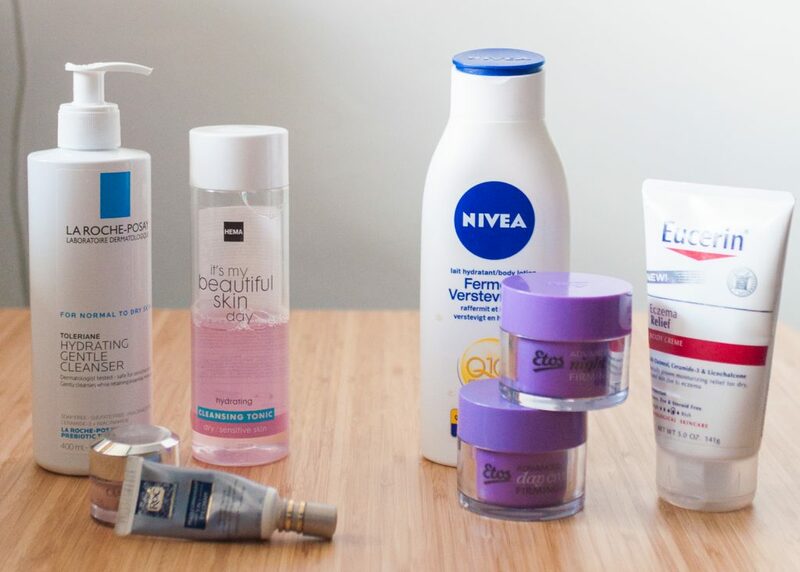 What does your skincare routine look like? Let me know in the comments — I’m always interested in experimenting with my routine and shaking things up.